Membranes, like everything in cells, need to be controlled and maintained in order to behave in a way that means the individual can remain alive. There is nothing new in this observation, it is a widely-understood and observed process called homeostasis. However, understanding the controls that govern the homeostasis of physical barriers like the membranes of cells is at a much earlier stage. Once recent development has come from a lab in Southampton, from a group of scientists who have used both lipidomic and physical analyses of the lipid fractions from eukaryotic cells to determine how the membranes of such cells may be managed . One important consideration, and the focus of the study by Dymond et al. is the control of membrane stress. This may sound trivial or at least a parameter one would assume was kept to a minimum, but rather like the power from a car engine, a certain amount of stress in the membrane is a useful thing. However, this stress is not sufficient to make the membrane bend out of shape spontaneously, and so is known as ‘stored curvature elastic stress’. Instead the stored stress means that when a membrane needs to bend, it can do so in an energetically favoured manner. Such bending processes are vital in the killing off of invading microbes by white blood cells, during the formation of vesicles for transporting neurotransmitters and for cell division. In order for the curvature elastic stress and the processes themselves to be controlled, the correct lipid building blocks are required. 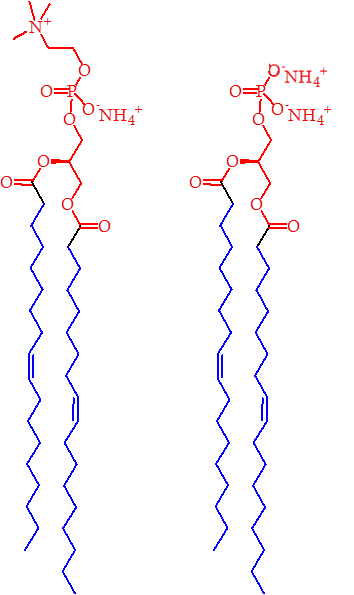 There is good evidence that the lipids present have a dominant influence on the curvature of the assemblies they form, and can even be divided up into ‘types’ on this basis. However, types 0, I and II (Figure 1) seem rather indistinct when we consider how slight curvature might be controlled. A hypothesis based on there being more than just these three types seems more plausible when we consider that lipidomics studies suggest that there are typically several hundred lipid species in even relatively small biological systems [2-5]. Figure 1. Left to right, a type II lipid, inverse cone,e.g.PE; a type 0 lipid, cylinder, e.g.PC; a type I lipid, a normal cone, e.g. lyso-PC. This has led the Southampton group to research the possibility that there was a universal ‘pivot’ species, i.e., one in between those we currently term type 0 and type II, that appears consistently in all cell lines and growth conditions. The number of lipid species present meant that there were a number of possible candidates, although certain ones, like lyso-PC could be ruled out immediately. The possible candidates for this pivot species were phosphatidic acid (PA) and phosphatidylethanolamine (PE), the structures of which are shown in Figure 2. The latter may seem an unlikely candidate for a pivot species as it is typically an example of a type II lipid, however, it requires 80% PE to deform a PC system to a type II surface (inverse hexagonal phase). As 80% makes PE the dominant species in that system, it seems reasonable that its power as a type II lipid is not particularly dominating, unlike that of inositide lipids [6,7]. A lipid that is type II in isolation might therefore produce stored curvature elastic stress when mixed with other lipids, especially as a component that is not a majority one. Figure 2. The structures of PE (left) and PA (Right). The blue regions represent the lipophilic part of the lipids, with the red portions representing the hydrophilic parts. On this basis, the head group of PA appears to be smaller than that of PE, suggesting it too might be a type II lipid. The possibility of a pivot species that is PA is therefore intriguing. It is normally a type 0 lipid, so in order for it to be a pivot species, it must acquire something recognisable as type II character, purely as a way of preventing it remaining simply a type 0 species. The structure of PA (Figure 2) suggests that it has a small and narrow head group, and so it is conceivable that under certain circumstances, that it might exhibit type II morphology (Figure 1), however Dymond et al. report that although this lipid demonstrates some of the character consistent with a pivot species, it does not exhibit the universality required to fit with a general observation. Thus, emphasis fell upon the universal pivot species being a PE lipid. Some variety of fatty acid residues was also observed to influence the identity of the universal pivot lipid. Although this would be expected to influence only the temperatures at which phase transitions occur, this factor appears important as temperature itself is controlled homeostatically and it seems likely that the two must agree in order to give a stable system. The natural progression for work such as this is to use it to assess the observations made about lipid compositions in different systems, for example in a comparison of the lipids in cellular membranes of people with obesity-onset diabetes . It therefore seems clear that the presence of a universal pivot species is a useful means for probing both systems under normal, homeostatic conditions, but also for developing an understanding of the physical manifestation of disease, and thus inspire therapies as a result. M. K. Dymond, C. V. Hague, A. D. Postle, G. S. Attard, Journal of the Royal Society – Interface 2013 10, 20120854. S. Furse, S. Liddell, C. A. Ortori, H. Williams, D. C. Neylon, D. J. Scott, D. A. Barrett, D. A. Gray, Journal of Chemical Biology, 2013, doi:10.1007/s12154-012-0090-1.